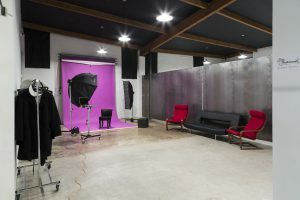 Parkwood Photography Studio is located in the Phoenix Photo District. We offer several shooting locations on site including 5 suites, co-working spaces, common areas, frosted glass garage bay door, outdoor areas and a lush garden area for natural light studios. The 5 suites include 5000 sq feet of shooting space with a 25×20 foot cyclorama wall with a bay door for vehicle access. Extra high ceilings give you headroom to set lights high if needed. Plus a co-working desk space for post-processing or editing your projects. Our contemporary furniture can be used for meeting clients, art directors or props to shoot with. Also, visit the onsite custom photo lab & printshop. Each Studio can be converted into a fully functional educational & classroom space for corporate meetings, industry events, seminars and workshops of any kind. Our larger suite holds 130 seats and our smaller suite holds 65 seats. We have folding chairs, bar tops, folding tables, flatscreen TVs, projectors and a PA system available. Parkwood Studios offers Monthly Memberships as well as Hourly Rentals both on weekdays and weekends. Contact us for event rental pricing.